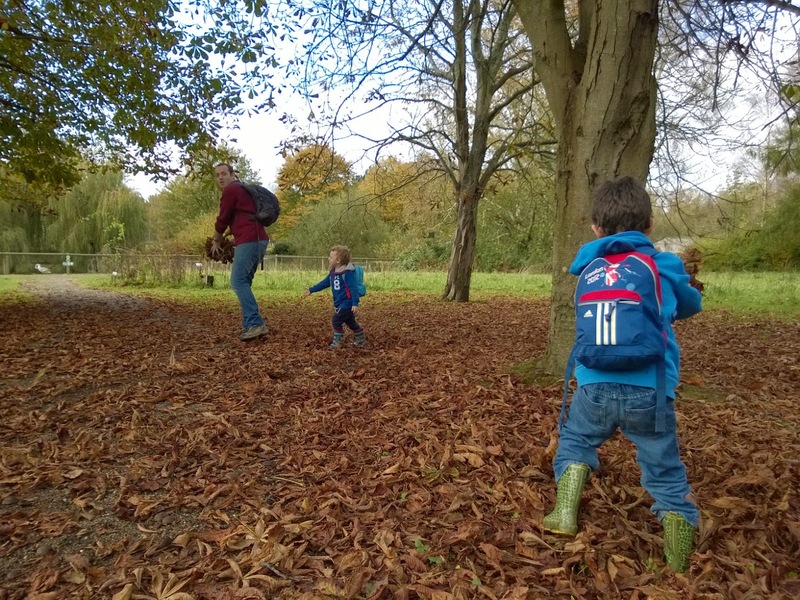 Last Saturday we took advantage of the Autumn sunshine and unusually warm weather to take a trip out to Bentley Wildfowl and Motor Museum near Ringmer in east Sussex. This place is fantastic for kids. There is a miniature railway that you can take a ride on, with Stations at strategic places around the site. There is a collection of classic cars and motorbikes which even includes the impressively creepy Hearse used in the original Dracula film which was found in a barn, restored in the 1960s and is now used by a local funeral company. through with a huge collection of waterfowl paintings, and woodland to play in with examples of ancient house reconstructions. 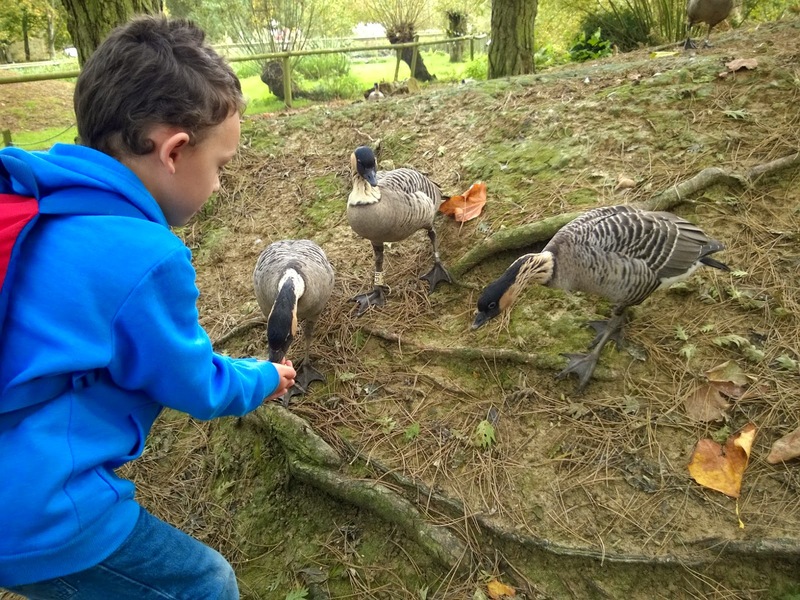 Best of all for my boys though (apart from the railway) is the amazing collection of wildfowl which you can feed with grain bought from the gift shop. There are about 147 varieties of wildfowl in the world (ducks, geese and swans), of which 125 are found at Bentley. The collection was built up by the former owners, who gifted the core of the estate to the people of East Sussex when they died. My favourites are the Hawaiian Geese, which were nearly extinct until a breeding program brought them back from the edge. Hundreds of the geese bred at WWT sites including Slimbridge and Arundel, plus those raised at Bentley, have been returned to Hawaii helping to bolster their numbers in there home country. After a happy day of feeding the ducks and geese, riding on the train, enjoying a cup of tea in the cafe and admiring the house and garden we finished in traditional Autumn style with leaf throwing (all lovely and clean as there were no doggy visitors on site). 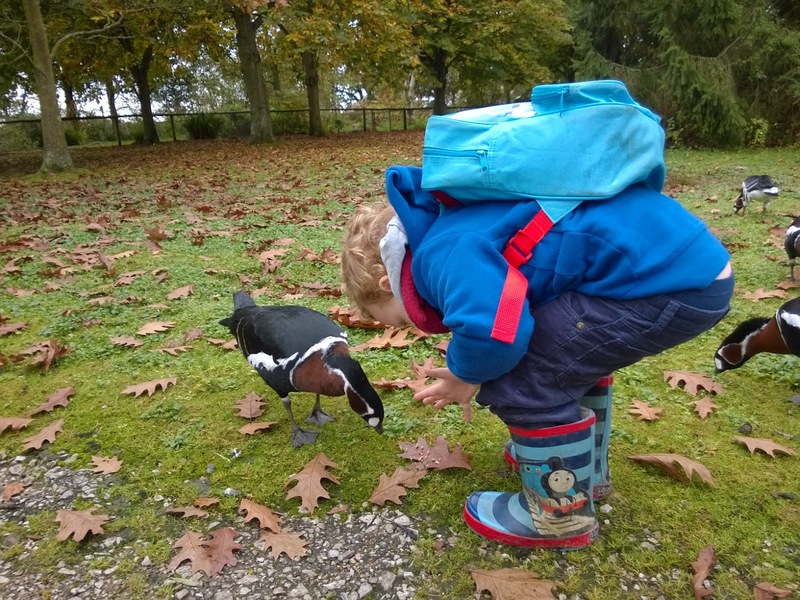 The different types of wildfowl had interpretation panels explaining about their habitat, where they came from and so on which provided a good opportunity to explore different species and look at world geography and habitats, but most importantly this was a lovely hands on opportunity to enjoy tame birds that fed happily from the boys hands, or around their feet, a very special experience for all of us. Notes: the site is wheelchair and pushchair accessible for the most part. Guide dogs are allowed around most of the site but not in the wildfowl walk. There are toilets, a disabled toilet and baby changing facilities. Parking is ample. Hand sanitizer is provided as you exit the waterfowl walk, but I would recommend heading up to the toilets after you have finished with the birds to wash little ones a hands with soap and water. There are picnic benches in the play area and there is also a cafe and a gift shop.